WASHINGTON, D.C. -- Americans continue to view the Democratic Party more favorably than the Republican Party, with little evident change after the election that saw the GOP win the White House and keep control of both houses of Congress. In a Gallup survey conducted Nov. 9-13, 45% of Americans view the Democratic Party favorably, compared with 40% for the Republican Party. 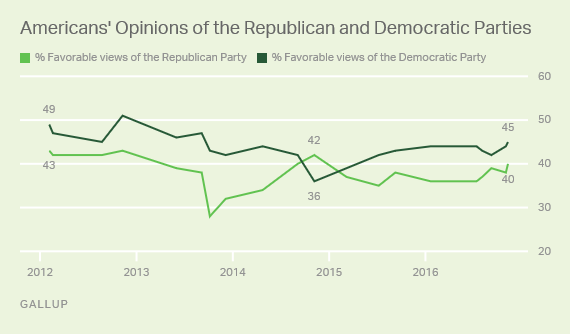 Americans have viewed the Democratic Party more favorably than the Republican Party for most of the past four years of the Barack Obama administration, except at one point immediately after the 2014 midterm elections. This year's election did not drastically change how Americans view the country's two major political parties, which is normal after presidential elections, with a few exceptions. In 2012, favorable views of the Democratic Party edged up from 45% to 51% after the election. In 2008, the Republican Party's favorable image dropped from 40% before to 34% after the election. Party images were essentially stable after the 2004 election. 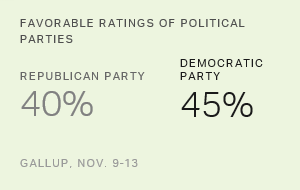 The Democratic Party's favorable rating has been lower in recent years than the average before 2010. 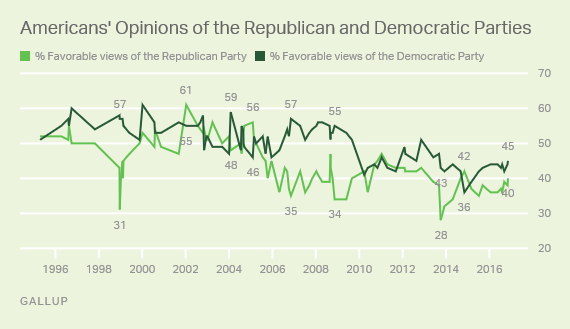 The Republican Party's favorable rating has clearly been lower in recent years than it was during the beginning of the George W. Bush administration. Democrats enjoyed their highest favorability advantages over the Republican Party between 1996 and 1999, and again between 2005 and 2009. As noted, they have enjoyed a more positive image in most years since 2011. Republicans have never had a more positive image than Democrats for any consistent period over the past quarter century. The Nov. 8 election does not appear to have changed Americans' modestly more positive views of the Democratic Party, at least in the short term. Beginning in January, Republicans will add the White House to the branches of government under their control, providing the GOP with an opportunity to shift this image balance. Results are based on telephone interviews conducted Nov. 9-13, 2016, with a random sample of 1,019 adults, aged 18 and older, living in all 50 U.S. states and the District of Columbia. For results based on this sample of national adults, the margin of sampling error is ±4 percentage points at the 95% confidence level. For results based on the total sample of 940 registered voters, the margin of error is ±4 percentage points at the 95% confidence level. Interviews are conducted with respondents on landline telephones and cellular phones, with interviews conducted in Spanish for respondents who are primarily Spanish-speaking. Each sample of national adults includes a minimum quota of 60% cellphone respondents and 40% landline respondents, with additional minimum quotas by time zone within region. Landline and cellphones numbers are selected using random digit dial methods. Landline respondents are chosen at random within each household on the basis of which member has the next birthday. House Speaker Paul Ryan's favorable rating increased slightly from 44% in August to 48% after the election. Economy, Elections Top Problems Facing U.S. The economy and elections top the list of the most important problems Americans say the U.S. faces today. Concerns about elections and election reform are at an all-time high. Donald Trump's favorability rating has improved from 34% to 42% after his election win and is his best since 2011.